If you do, it’s time to head on over to your local RadioShack. The iconic retailer is now selling the last of its remaining office supplies as part of a liquidation process brought by a bankruptcy filed in March, and everything must go. RadioShack is peddling pretty much everything it still owns, including some very questionable items like these waterlogged clipboards (for only 50 cents!) and a giant 50 gallon trash can that frankly has no business being anywhere except for a suburban mall. Still, it’s super cheap, so why not pick one up if you have the space for it? The sad collapse of RadioShack started back in 2015, when the company filed for bankruptcy for the first time. There was a moment shortly afterward when it appeared Sprint would save the company by co-branding stores in an effort to compete against their largest telecom rivals. But the deal didn’t last long. Sprint inevitably abandoned the project, and RadioShack had to file for bankruptcy for a second time in March 2017. The iconic retailer announced in the second bankruptcy filing that it would close approximately 200 stores and would evaluate the remaining 1,300 stores. Based on its latest string of thirsty tweets begging people to come and buy the last of its garbage, it seems like the liquidation process is well underway. 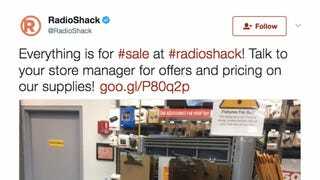 Au revoir, RadioShack! You will be sorely missed, but at least some of will have the smell of a dank old clipboard to remember you by.